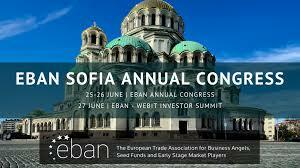 The EBAN Annual Congress is one of Europe’s largest and most international business angel events held annually by EBAN in cooperation with its best members. After 18 successful editions of the event, the last of which took place in Porto in 2016 and Malaga in 2017, this year’s edition of the event is coming to Sofia, Bulgaria on 25-26 June 2018 at the Central Military Club and will be organized in collaboration with Eleven Ventures, Bulgarian Business Angel Association and the European Investment Project Portal (EIPP). The EBAN Annual Congress 2018 will be a spring of new ideas and trends, bringing together the world’s most eminent business angels, entrepreneurs and opinion makers, and enabling networking and dealmaking with experts in the field. We are expecting more than 300 participants from the early stage investing market as well as 50 startups from all over Europe and beyond.